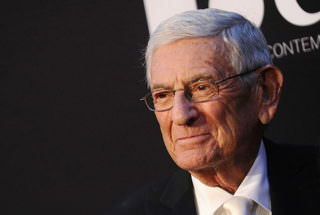 Eli Broad, the prominent education philanthropist and charter school booster, is retiring to spend more time with his family, according to release from The Eli and Edythe Broad Foundation. The Broads have given away more than $4 billion to education, health and science research, and contemporary-arts causes. They’ve pledged to give away 75 percent of their wealth. Broad, 84, considers money given to education and medical research his biggest accomplishments, he told The New York Times, which was the first to report the news Thursday. The Broad Foundation has also supported The 74 and LA School Report. Broad has long backed charter schools and other public education reforms. The Broad Foundation’s education grant recipients include some of the most prominent organizations in education reform, from Teach for America to KIPP to Harvard University. Steve Barr, founder of Green Dot Public Schools (a Broad grantee) Tweeted on Thursday night that Broad is a “hero” and thanked him for “bringing hope, love, and results” “on behalf of thousands of scholars” from Los Angeles. From 2002 to 2014, the foundation awarded the Broad Prize for Urban Education, which gave scholarships to graduating seniors from top-performing districts, including Houston, Boston, and New York City. In 2012 the foundation launched the Broad Prize for Public Charter Schools, a $250,000 award for college readiness to a charter network helping low-income students and children of color succeed. This year’s winner was Success Academy in New York. The foundation has also supported training urban school superintendents through the Broad Academy, a two-year leadership development program. Broad’s long backing of charters, including campaign contributions to charter school supporters, attracted criticism from teachers unions. Unions picketed the opening of the Broad Museum in downtown Los Angeles in 2015 and later planned protests citywide against the “Great Public Schools Now Initiative,” which sought to raise philanthropic dollars to add 260 charter schools in Los Angeles that would enroll half of the city’s students. The plan was retooled to focus on increasing access to high-quality education for 160,000 students in failing schools in 10 neighborhoods by replicating and expanding successful schools, both district and charter. This year, Broad has not shied away from criticizing the Trump administration. He urged senators to vote against confirming Education Secretary Betsy DeVos, criticized the sharp education cuts in the administration’s budget proposal, and encouraged the president and Congress to continue protections for recipients of Deferred Action for Childhood Arrivals, which offered immigrants brought to the country as children without documents temporary legal status so they could attend school or work. Disclosure: The Eli and Edythe Broad Foundation funds The 74 and LA School Report. This article was published in partnership with The 74.